You can gain in-game benefits in Fused Finale and other games through Fooldom Come! Fused Finale won 2nd place in BYOND Casual's Imagination Competition! I hate my job and my immobility. I prefer to sing. I am the AI fused to the ceiling. I manage the four scanners of the warp gate. I make travel safe for both the organic and the synthetic in what management hopes is an energy efficient manner. Both injuries and wasted energy lower my productivity rating. Threats of lawsuits force management to run diagnostics after we close. I shut up and listen, but they're just trying to confuse me. Though it lets me keep singing, I will inevitably be dismantled. I'd rather go out with style. Subscribers can start on any level they have experienced and their high scores for each will be saved. ah... funny I didn't notice that... prolly not until I was looking at the bottom of the health bar. @PopLava: You might be seeing that higher levels cause more damage. Also, the meter starts from the bottom again when it passes the top. I noticed my health bar was acting pretty wonky. At one point, I had the #1 down there and the bar was fully white. I took a hit, and it went down to nearly the bottom. 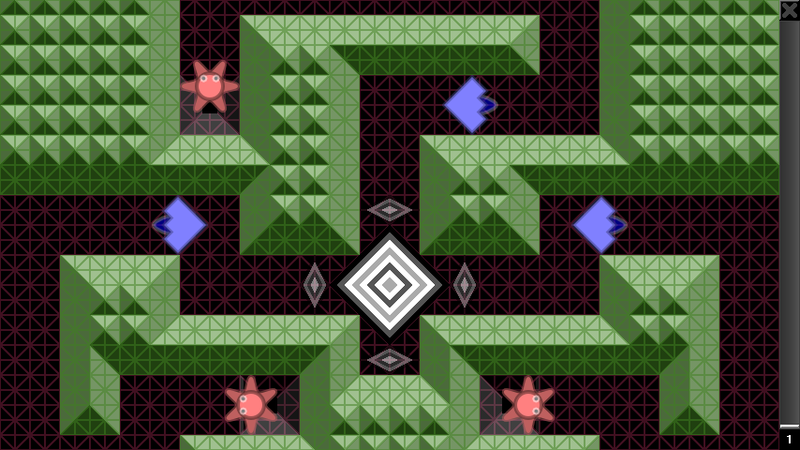 On or around lvl 3 or 4, the level is clipped. Not sure if that was by design or not. This screen shows the high health bar when I only had 1-2 hits left as well. "I can't really hear any rhythm or sync'ing of beats going on." Ever hear a choir sing "Frere Jacques" or "Row, Row Row Your Boat" in time-offset layers? Picture that with more variations added to each new layer. As for the significance, I'm sort of trying to figure out how to make a rhythm action game work with raw mechanics rather than familiarity with the soundtrack. Many games in the genre seem to thrive on nostalgia, but I don't find their actual gameplay appealing. - By the way, feel free to nuke these comments when you're done with them. The game ended and I was in the middle of pounding on my arrow keys and your interface design through me right back into a new game in a blink of an eye so I didn't get to relish in my score. 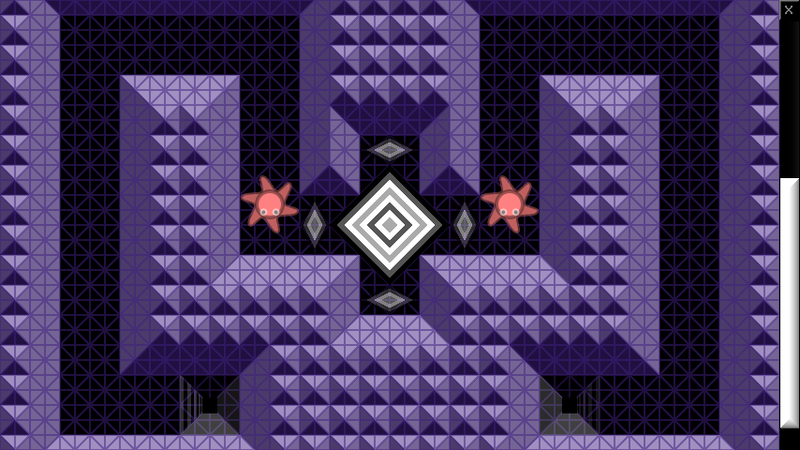 I've always appreciated your abstract art and approaches in your games. As I'm playing this, I can't help but think of a some other ideas for a less "abstract" version. 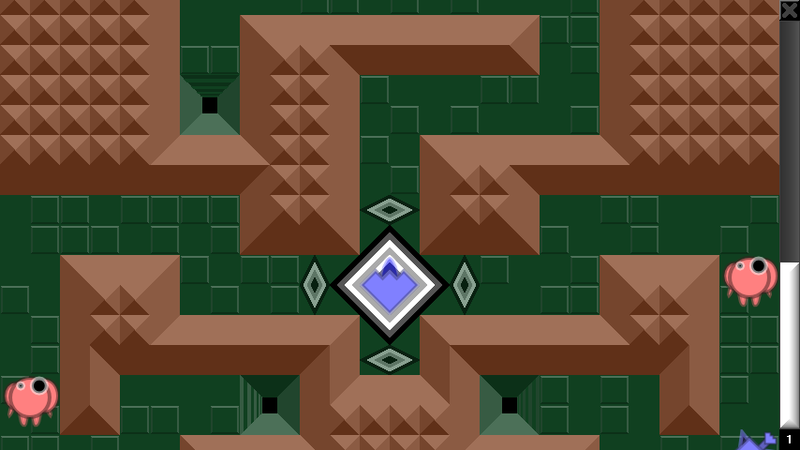 This core concept of button mashing in the middle of a maze might be fun without the additional logic and beat matching. It would be far from original though. I may toy with the idea some. lol... I hate the shadiness that comes with being inspired by another persons work that isn't a stranger to you. I also hate that people don't share projects because I know my intentions are solid gold but when I ask myself if I would share my half written project with some half-stranger, my immediate thought is, no way. Why would I give them all my hard work and "potential". Funny Brain. Anyway, in short. I think this is pretty neat and inspiring although, I honestly don't get the significance of the generated music. I can't really hear any rhythm or sync'ing of beats going on.